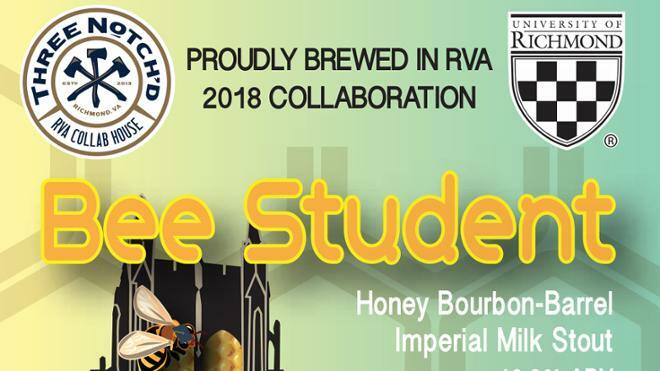 On June 14, 2018, Three Notch’d RVA Collab House released Bee Student, a limited release honey bourbon-barrel imperial milk stout that was the product of a collaboration between Three Notch’d RVA Collab House and the University of Richmond. The stout’s release celebrates the School of Professional & Continuing Studies (SPCS) Brewing Education Program, the UR Office for Sustainability, and the University’s collaborative effort to host honey bee hives on campus. 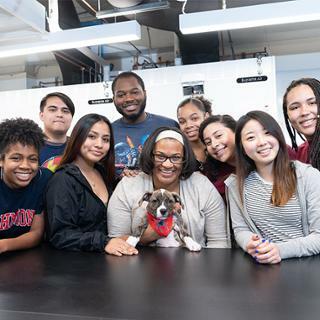 The story behind Bee Student reflects the web of interconnectivity that the University weaves throughout the Richmond community. The University’s bees are the inspiration for brewing Bee Student. The University hosts two bee hives, located between the Wilton Center by Cannon Memorial Chapel and the steam plant. The hives serve “as a sustainable and educational response to bee populations’ global decline,” according to the Office for Sustainability’s information on campus sustainability, and provide opportunities to engage “faculty, staff and students in research and learning opportunities” about the role of bees in local and global food systems. The University’s beekeeping initiative is itself a collaboration between University Facilities, the Department of Biology, the Office for Sustainability, Dining Services, Public Safety, faculty bee experts, and the School of Professional and Continuing Studies. The honey used in brewing Bee Student didn’t come from UR’s bees (although it’s hoped they can provide honey in future collaborations with local brewers and chefs). But the honey does have a UR connection. The honey was supplied by Black Heath Meadery, whose mission is to “support Virginia beekeepers to help establish hives for sustaining the bee population and Virginia agriculture.” The mead maker at Black Heath Meadery, Bill Cavender, R’89, is a Richmond graduate who earned a bachelor’s degree in political science. Cavendar was featured in a February 2015 University of Richmond Magazine article, The Buzz about Mead. The recipe for Bee Student is a collaboration between Stefan McFayden, former head brewer at Three Notch’d RVA Collab House, and Bobby Faithful, program specialist for the SPCS Brewing Education Program and an instructor in both the Beer Brewer Professional Certificate program and the School’s Professional Brewers Series. The Three Notch’d RVA Collab House brews “Richmond-centric craft beers and collaborations” in partnership with local restaurants, home brewers, nonprofits, musicians, artists, businesses — and now, universities. McFayden and Faithful recruited SPCS staff members Garrett Stern, senior program manager for professional education, and Vivian Marcoccio, graphic designer on the School’s marketing team, to assist in the brewing, storing and tasting of the recipe. Incidentally, Garrett and Marcoccio reported that Bee Student tasted good, even before it was ready to be released officially. The Bee Student bottle label, excerpted above and shown in full to the left, was designed by Marcoccio, who also graduated from the Beer Brewer Professional Certificate Program, has taken several classes in the Professional Brewers Series, and has been instrumental in encouraging local craft brewers to join the School’s extensive list of partners in brewing education. She’s also a home brewer herself, and has brewed and bottled several batches of her own beer, mead and wine. The Beer Brewer Professional Certificate Program itself represents an intriguing example of collaboration. 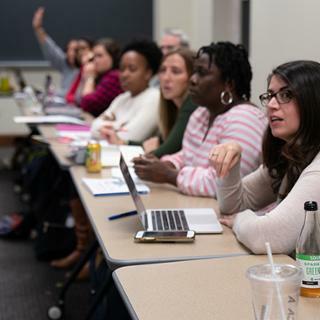 Instructors in the program include beer aficionados like Faithful, local craft brewers, and UR Associate Professor of Biology Angie Hilliker, who studies yeasts (among other things) and teaches about yeasts and fermentation processes in the program. The program is managed and hosted by SPCS, but local breweries, cideries, meaderies and brewing suppliers host student internships, a requirement of the certificate. The program boasts 14 regional partners, many household names on Richmond’s craft brewing scene. A little farther afield, but still related to those bees that inspired Bee Student, the SPCS Permaculture Design Certificate program, itself a collaborative effort with the Shenandoah Permaculture Institute, recently assigned as its final project proposing designs for the University’s Eco-Corridor construction and stream restoration. The Eco-Corridor is home to the bee hives, and the design proposals incorporated bee-sustaining plants and landscapes in addition to learning, teaching, research, and relaxation spaces. The student proposals may be among possible designs for construction and stream restoration. The benefactors are the bees, and those who seek to protect and study them. Bee Student is precisely the kind of collaboration that Three Notch’d RVA Collab House seeks. It’s also the product of a remarkable ecology of connections that enables Richmond’s craft brewing industry to flourish and attract visitors, restauranteurs, distributers, suppliers, and workers to the region. Bee Student is a tasty, toasty stout, but it’s also a symbol of successful collaboration among industry and education.